From the author of Mel Bay's best-selling book, Learn to Play Fingerstyle Solos for Ukulele, we are proud to present, Favorite Fingerstyle Solos for Ukulele. 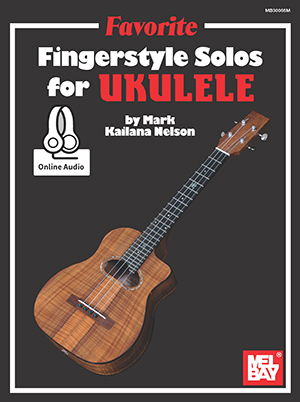 This book and accompanying audio offer a variety of fingerstyle solos for the ukulele. The music stretches across several styles, including Hawaiian, ragtime, bossa nova, and classical. The solos progress in difficulty, and tips on technique are included along the way. More advanced arrangements introduce chord inversions and different rhythmic approaches for the right hand. Thirty-three arrangements are presented in standard notation and tablature. Transposition charts are included for baritone ukulele.